In honor of Halloween, we would like to highlight some marine “monsters.” These monsters are the most frightening type of all. They are taking over new regions, rapidly increasing in numbers, and eating everything in their paths. These species are… marine invaders. Lionfish are predatory fish, meaning they eat other fish, that are native to the Pacific Ocean. They were introduced to the Atlantic Ocean, off the coast of Florida through the aquarium trade, and have since spread throughout the Caribbean Sea. In the Pacific, it is an exciting thing to see these ornate fish when snorkeling or scuba diving. So if they are on reefs in the Caribbean, it just means people have another cool fish to see, right? Wrong. 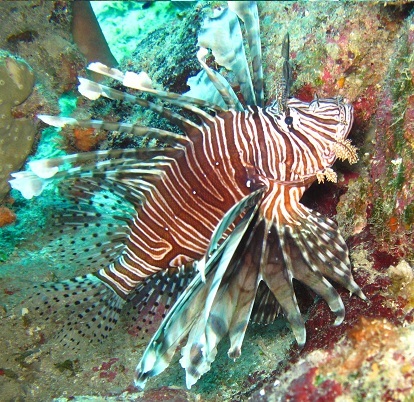 While it is great to see a lionfish in the Pacific, they can be damaging reefs in the Caribbean. Lionfish have been shown to reduce reef fish recruitment, or the amount of baby fish, more than a native predator (Read more here) and have also been attributed to a decline in reef fish in the Bahamas (Read more here). This reduction of baby fish means fewer adult fish as well as less food for the native predators in the reef. Lionfish are predicted to have many other negative impacts on marine ecosystems, which you can read more about here. Another problem with lionfish is that they have no natural predators in the Caribbean. 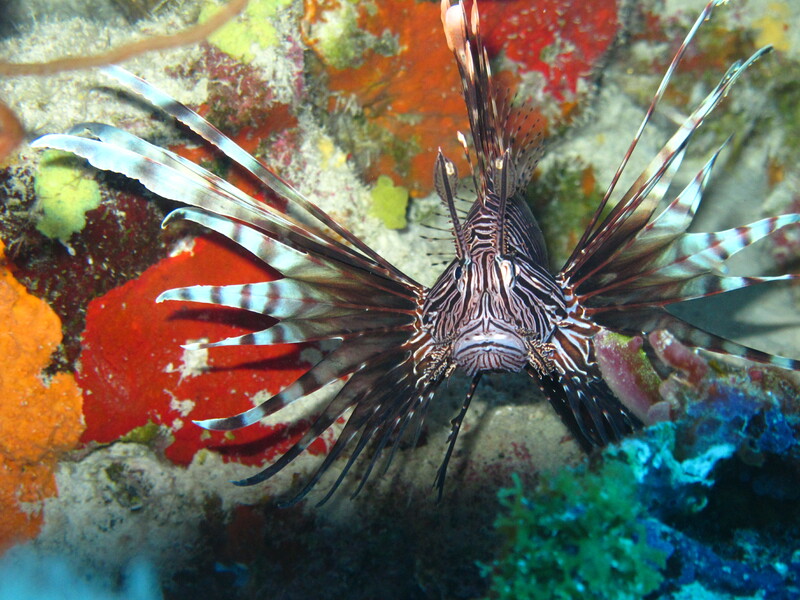 Although some sharks and other native predators will eat a lionfish that has been speared, native predators are not going to control the lionfish invasion (Read more here). So what can we to do to save coral reefs from this “marine monster”? Well, to start, we can spear and eat them! They are easy to spear and they taste just like snapper or grouper! So the next time you are in the Caribbean or the East coast of the Atlantic, spear lionfish, participate in a lionfish derby, or just order lionfish off the menu! Previous post ← Story telling in science? Is it valuable? The science says yes!